Similar devotional plaques (caturviṃ śati-patta), placed on altars, are used for domestic prayers but can also be offered as ex-votos. Many have somewhat long inscriptions, like this one in Gujarati, a language written in the devanāgarı̄ characters of western India, as the Jain community is particularly large on the Gujarāt peninsula. The inscription on the back of the piece indicates the date of consecration as 1464 (Samvat 1521). In the center of the composition is Mahāvı̄ra, the Jina (Tirthaṅ kara) of our cosmic period, and the most recent of the 24 Jina in succession down through the ages. He is said to have lived in the 6th or 5th century B.C.E. and have preached the basic tenets of the Jain religion. The stylized lion engraved on the base, right below “the Victorious One”, guarantees his correct identification. Two other lions are visible on the base. Between them, a small stylized chapel contains an image of the goddess Lakṣmı̄, which is frequent with this type of object. Around him, in registers, and in addition to the 23 other traditional Tirthaṅ kara, are more Jina, for a total of sixty, including the main hero. This ensemble is unusual but not unique. There is a handsome example, contemporary with this one and conserved in the Norton Simon Foundation in Pasadena (Pal, 1994, p. 150, n° 37). This author even mentions a plaque with hundred and five Jina. Most of these characters are sitting in a meditative pose, naked, their hands in their lap, except for two who are standing, facing full front and without clothing as tradition dictates. The bibliography presents several similar plaques from the 14th - 15th century (Granoff, 2009, p 203, n° S 22; In the image…, 1982, p.189, n° 327; Pal, 1988, p. 146, n° 65). In spite of a seeming repetition, there are many major variations, both in composition and style. In this piece, the multiplication of openwork, especially in the halo, gives an illusion of mystical light emanating from the holy image. Granoff, Phyllis, Victorious Ones. Jain Images of Perfection. New York : Rubin Museum of Art, 2009. In the Images of Man, Londres : Arts Council of Great Britain, 1982. Pal, Pratapaditya, Indian Sculpture, Vol. 2, Los Angeles : Los Angeles County Museum of Art – Berkeley, London, Los Angles : University of California Press, 1988. Pal Pratapaditya (Dir. 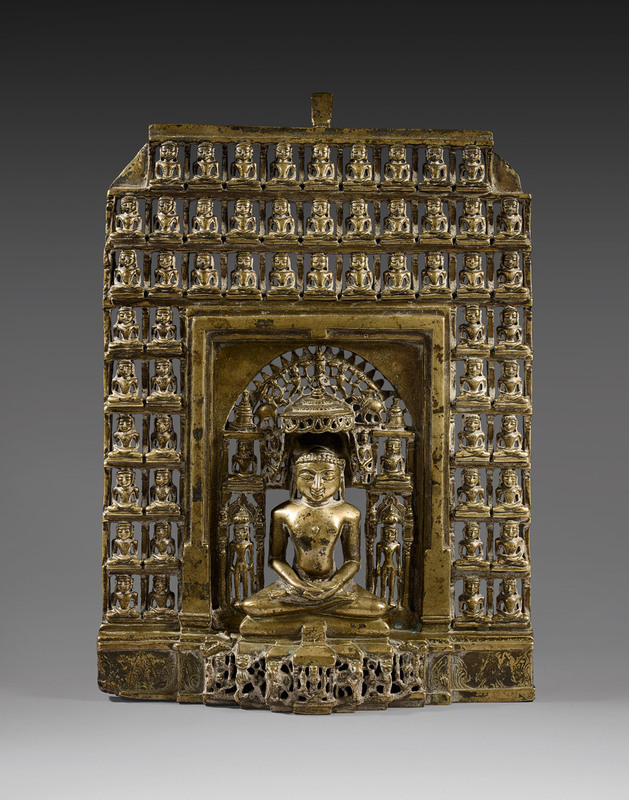 Et auteur), Jain Art from India The Peaceful Liberators. Los Angeles : Los Angeles County Museum of Art, 1994. Provenance : Private collection, Europe, since the 1980s. Private collection, 1997-2008. Private collection, USA, 2008-2015.